A few years back was an extraordinary documentary entitled Man On Wire, which looked at a man named Philippe Petit, whose mad obsession was tightrope walking across incredibly tall building, culminating in an illegal stroll between the newly built Twin Towers. Now Back To The Future and Forrest Gump director, Robert Zemeckis, has taken that story for a muddled biopic which has the most amazing final act and the best 3D ever. 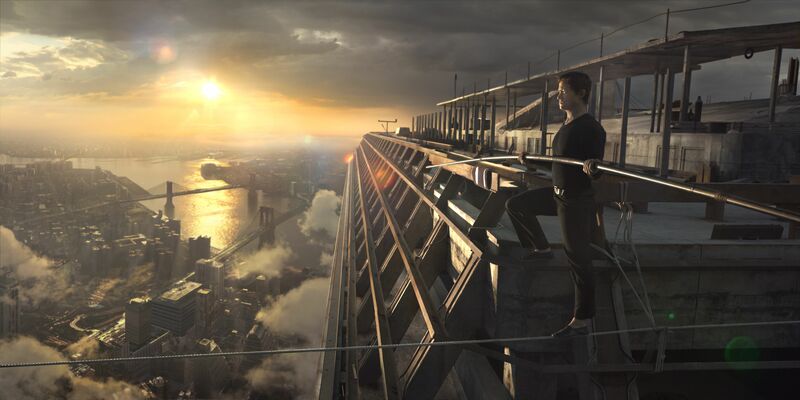 Philippe Petit is a Frenchman with a passion for walking the tightrope. From his humble days as a street performer, finding trees and lamp posts to perform his tricks, he has a dream. Wanting to walk between the two towers of the newly built World Trade Towers. With a small crew, including his singer girl friend, Annie, they head to New York where they plan the perfect break-in in order to set up this passionate yet crazy stunt. Anyone who had seen the 2008 documentary by film maker James Marsh, will find The Walk problematic. We know the story already. In rich detail, we were told the story of Philippe Petit, his back story and his plan to climb these high buildings. The bulk of the film is the World Trade Centre walk. 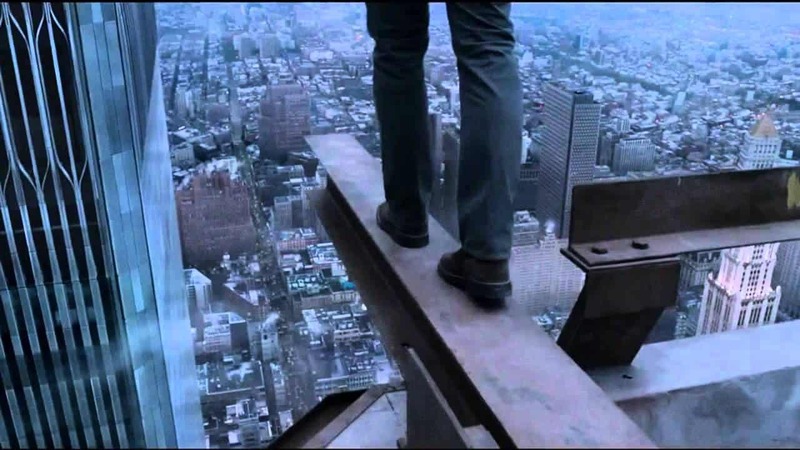 So watching Zemeckis’ film is like watching a dramatic re-run of the original film, leaving us without the high level of tension and suspense that getting to the top of the towers bring. It’s also problematic for those who haven’t seen the documentary in so much that the adverts, trailer and poster basically give the game away. The film is being pushed on the strength of the finale. This is the biggest spoiler ever. Having said that, the finale is the movie. Without it, this would be a so-so biopic of a man in love with danger, with his lady and with himself. The first two-thirds tells of Petit’s life, how he became a walker, meeting the various people who helped him to perform such dangerous stunts, all aided by a narration from Petit standing on the Statue of Liberty with the Towers as a background. All of this is created in a very twee manner. Flashy cinema tricks, black and white, unusual angles abound, it’s as if Zemeckis doesn’t have the courage just to tell the story, he needs visuals to make it just that little bit more interesting. The film then kicks into another gear, coming on like some half-interesting heist movie from the 70’s, with Petit and his team going through the motions of breaking into the towers, surveillance, disguises etc. Accompanied by a funky, cool soundtrack from Zemeckis regular Alan Silverini. Yet it lacks the tense, the fear that they may get caught. In fact, it all seems very matter of fact. Finally, the saving grace of the film. The Walk. This is the masterstroke from the director. A nerve-jangling, nauseating-fuelled sequence in which we are out on the wire with Petit, cameras flying around him so we can view every angle of every step. Firstly, the creation of the Twin Towers and the hundreds of miles below by CGI are seamless. It feels so real, you can believe they are still standing. Secondly and this is something I didn’t think I would find myself saying. The 3D is incredible. To really appreciate these moments, you need to see it in the biggest screen possible and you need to see it wearing the grey glasses. It is utterly breath-taking. The performances are fine, made up from a cast of French/Canadian actors, mainly unknown. Ben Kingsley pops up as Petit’s grumpy Czech mentor, while Charlotte Le Bon, last seen in The Hundred Foot Journey, makes for an appealing love interest. As Petit, Joseph Gordon-Levitt give the part a sense of likeability, even if the strong French accent does occasionally slip from solid to Clouseau to losing it completely. Still, Levitt is an interesting enough actor to watch to forgive any real vocal problems. 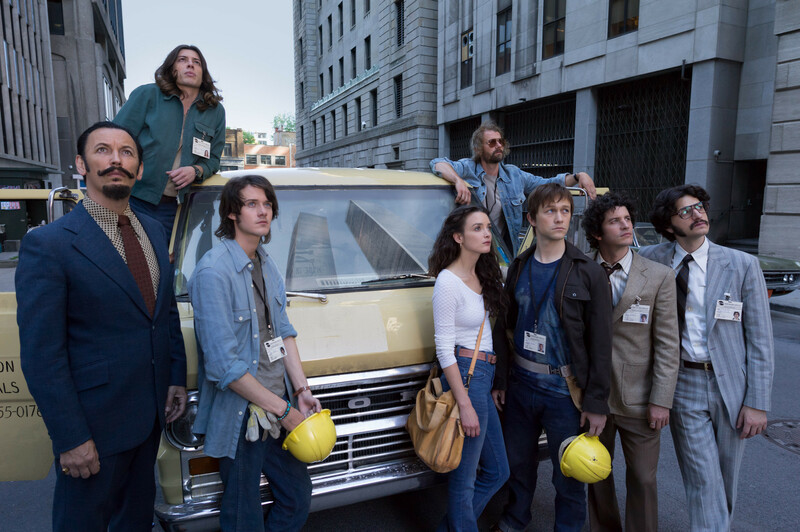 The Walk is an uneven, often stodgy biopic that has that one crowning moment of glory. At two hours long, it is a journey, as you wait for the finale. Once you get there, the film lifts into another level and we get one of the most impressive cinematic moments in a long while. Shame the rest of the film couldn’t match that last half hour.